I have neglected my other systems for too long and it seems to be about time to remedy that. With my recent acquisition of an Intellivision II system I felt the urge to go back and play through all the games I have for it. I don’t have many Intellivision games and honestly most of them wouldn’t make a very interesting review, but I do have one game that is just so meh that I can’t help but be slightly angered by it. The game in question is Star Strike, and I have incredibly mixed feelings about this particular title. Just to clarify this is for the Intellivision version of the game, not the 2600 version which is a whole other sack of potatoes, though I’ll probably reference it here or there because I’m inconsistent like that. The moment you start the game up you’ll see what this is a direct copy of… the trench scene in Star Wars. The trench movement is animated by at the time must have been a cool effect. The trench is animated fairly well; it forgoes the standard flashing segment that was more commonly used, a good example of this can be found in Bugs by Data Age. Star Strike has a wonderful looking starfield even if some of the colors aren’t actually possible, I don’t think green stars exist. 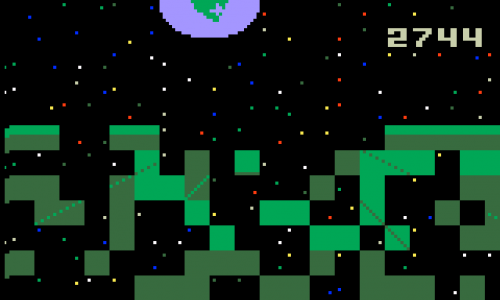 Up in the top left corner is the moon… our moon (which is distressingly absent in the 2600 version), and what’s that peeking out from behind it? Earth… Both look very good and are nicely detailed, you can even see North America on the planet’s surface, but not South America, which is startlingly absent, it seems the aliens have already sunk it. Speaking of aliens, these guys look goofy, blue pancakes in space goofy. It seems that instead of ripping off the generic TIE fighter look that so many other games already have, Mattel decided to copy the next best thing, Battlestar Galactica. The aliens bear a resemblance to the circular saucer shape of a Cylon Raider while the ship you fly looks a lot like the back of a tri engine Colonial Viper, what an unexpected crossover. The ship designs are incredibly simple, even for Intellivision, but that doesn’t stop the source material from bleeding through. There are a few other graphical effects that I found quite interesting, the Earth being destroyed is done spectacularly well with large and fluidly moving explosion sprites bursting everywhere, and destroying alien station is also rather rewarding as it quickly vanishes block by block revealing a screen full of stars. The sounds in Star Strike are fairly standard and not particularly impressive. Most of what you’ll be hearing is a particularly staticky engine noise and a bunch of weapons fire, the explosions are also high pitched and staticky and lack that chunkiness that makes shooting enemies so rewarding. The only sound that I really think is worth mention is the sound of the giant orange alien missile that fires at the Earth when you game over, it sounds like a really intimidating Theremin, and I kinda love it if only because it sounds so funny. The gameplay is where this Star Strike falters, and perhaps even fails. You will find the enemies to be obnoxious obstructionists who are close to impossible to kill. Enemies will approach you from behind, making them unkillable, they will then proceed to harass you, usually doubling up, by either firing at you or trying to ram you. Eventually the enemies grow tired of these shenanigans turn light blue and fly ahead of you finally allowing you to shoot at them, but you’ll find that positioning yourself directly behind them and firing at them will not destroy them; you have to shoot slightly above the enemy to destroy them, and by the time you do that they have left the screen as they can move faster than you. 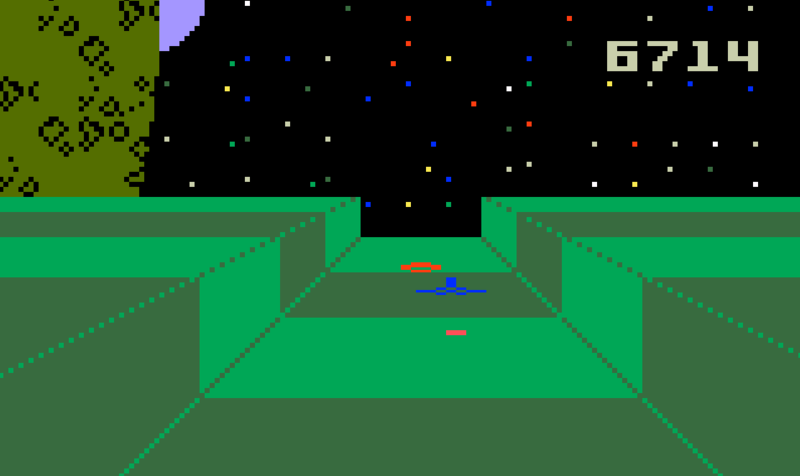 The game isn’t all about shooting enemies though, you might have noticed that both you and the enemies have small bars near the bottom of the screen, these denote depth, yours is always at a fixed depth for one important reason, the actual entire objective of the game, the enemies are just distractions to your actual purpose, destroying the evil flapjacks of death, they are just orange enemy sprites laying on the floor of the trench and you just have to destroy all of them. You have the usage of bombs, which is why you have the bar to denote your depth so you don’t miss all the time, if you successfully hit one with a bomb the entire screen will shake violently, there are five bombs total, and it’s a really good idea not to miss. In the hardest difficulty mode if you miss one flapjack it’s game over, but in the rest it’s something for more insidious, you have to loop back around and go past all the ones you missed previously to get another chance at hitting the target you missed one more time. Usually I missed the final target, which made the trip back around all the more obnoxious, thank goodness for the warp function, buttons 1 2 and 3 can increase or decrease your speed, which makes the return trips more bearable but I wouldn’t recommend them for anything else since it takes you forever to slow down and you’ll probably miss your target as it whizzes past at the speed of sound. The deck always seems to be stacked against the player, you’ll never get a free shot on a bomb target since you’re always being harassed by the enemies which are for the most part unkillable, you can position yourself as close to the bottom as possible to get an easier hit on the target but getting hit by an enemy makes you lose altitude so you’ll crash, and taking damage will also affect the movement speed of your ship which is not helpful. I know some people like this game, and I can honestly see why, it’s a unique take on the generic space shooter, but at the same time I find the game too frustrating to enjoy fully. This game is remarkably cheap, you can find copies of Ebay all day long, and none of them are over $10, unless you want a factory sealed copy but even those are as low as $6. Chances are you already have this game, if you have an Intellivision of course. Normally I would condemn a game like this to the Collector’s Zone but I honestly can’t when it’s so damn cheap, I will spare this game the Collector’s Zone but only by virtue of its worthlessness. I actually like Star Strike. I played it endlessly when I was young, and remember it fondly. Yes, the controls are a bit wonky, but that is the same for most of the old Mattel titles. I remember the thrill of winning the game with mixed feelings: If you fail, the Earth is destroyed in a spectacular explosion that leaves you in awe. If you win, the enemy base shakes and breaks up one square at a time until it's completely gone. I always thought there should be some fanfare or fireworks, or at least some message of victory. The rewards for saving the Earth from total annihilation seemed ... meh. In the end, I never cared about the problems with the game, and always enjoyed it -- it was a thrilling experience to play the Death Star trench battle back then. Hehehe, now that I think about it, it's the typical hero's burden: If you fail, everything you love and cherish will be utterly destroyed; and you're to blame for letting it happen. If you succeed in abolishing the threat to your homeland, nobody notices, and life goes on as normal. Loved Star Strike. Like Space Battle for the hoped rights to Battlestar Galactica, Star Strike was programmed on the hopes of gaining the rights to Star Wars. I think this would have been a awesome Star Wars game for the time and yes the trench effect was mind blowing. I think the awesomeness of that effect distracted me back in the day just looking at that. Played it in more recent times, got the hang of the controls, and liked it. I got where I could take out the enemy on a fairly regular basis. And after a while I started gunning for them. I actually like Star Strike. I'm glad you guys can find enjoyment in something I find so very meh. Perhaps I've been spoiled by other better games that came out at the time or later, but I can see how this game would have been pretty awesome back in the day. ...and that planet, was ours. Like which ones? I don't recall any other Death Star Trench Battle game back then. The closest thing was the Star Wars arcade, but that was with vector graphics but it cost a quarter per play. To me, a suitable replacement did not come until Rogue Squadron II: Rogue Leader for the Game Cube finally made the trench battle a key part of the game. In fact, it started there. Like which ones? I don't recall any other Death Star Trench Battle game back then. I'm just talking about space shooters in general, games like Phaser Patrol, and Star Raiders 1 and 2 (8-Bit version), and the Star Wars Arcade game on 8-bit, even the 2600 (I like that one quite a bit), and I cannot forget the absolute classic that is Trench on the BBC Micro by Virgin Games. There were a couple of arcade Star Wars knock-offs, like Space Encounters and Starhawk (which also made it to the Vectrex). The most blatant Star Wars knock-off was Star Fire, but that didn't have a trench sequence. The first official Star Wars video game (anywhere) was Parker Bros.' The Empire Strikes Back. Atari's arcade game came later.